God still has a grand destiny for the nation! 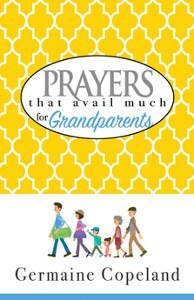 Germaine Copeland, author of the bestselling series Prayers that Avail Much, offers this timely, easy-to use guide to praying for our country. 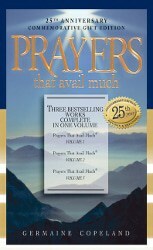 In her signature style, Germaine provides topical breakthrough prayers that you can pray over the United States for healing, restoration, protection, and Great Awakening! Christians cannot sit idly by while the nation crumbles. Lift your voice to Heaven, and appeal for healing for America! The earth is in a state of turmoil. There are wars and rumors of wars. Violence, corruption, and evil rise all around us. Learn how to call forth countries by name and pray God’s Kingdom plans over them. 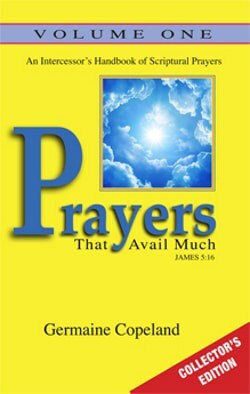 Featuring specific prayers addressing vital needs for the unique nations and countries represented. Learn to pray in agreement with the strategies of God for different people groups. As our world teeters on the brink of self destruction, will you stand aside and accept this dark fate, or will you choose to shape destiny? What kind of world will you leave behind for future generations? 3 signed books + Video course = $65 value for only 32.99! Your voice can change the world! 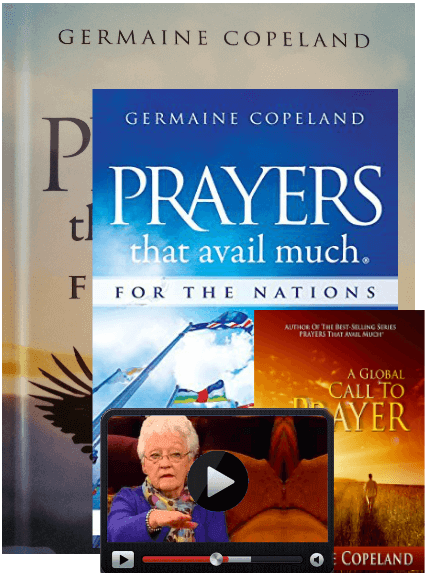 Germaine Copeland, author of the bestselling series, Prayers That Avail Much, presents an essential guidebook for everyday believers, intercessors, and prayer warriors to impact the nations with Heaven’s power. Through these prayer directives, you will learn how to partner with God for breakthrough on regional, national and global levels. Around the globe, your voice can have a resounding impact. When you align your prayers with God’s will, you become a mighty agent of change in our world! Afghanistan, Argentina, Australia, Brazil, Cambodia, Canada, Colombia, Egypt, France, Germany, Hong Kong, India, Indonesia, Iran, Iraq, Israel, Japan, North and South Korea, Mexico, Netherlands, Philippines, Russia, South Africa, Sweden, Uganda, and more! Lift your voice to bring God’s Kingdom power to our broken world. Don’t delay! This product is currently on backorder. When you order this package the signed copies of the three books will be sent out immediately. The video course will be mailed out as soon as production is finished.